Now that you’re well-versed in cooking with rum, it’s time to expand your alcohol-infused diet to the world of lagers, ales and pilsners. If you can stand to sacrifice part of your six-pack for the greater good of a delicious meal, try making one of these beer-starring recipes for your next dinner party. (Or just for yourself after a long day at work.) Don’t worry — there will be plenty of beer leftover to imbibe alongside your meal. 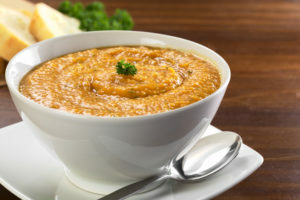 This is nothing like that boxed sweet potato soup that lines the grocery store aisles every fall. This homemade version gets its deep, complex flavor from the addition of Belgian-style white beer along with thyme, cinnamon and nutmeg. Serve the soup with or without a toasted mini-marshmallow garnish (though let’s be real, those are pretty much mandatory). While most people mix white wine into their risotto, this recipe calls for a lager (Landshark, anyone?) instead. And because cracking a can of beer is a lot easier than opening a whole new bottle of wine, we’re not complaining about the substitution. 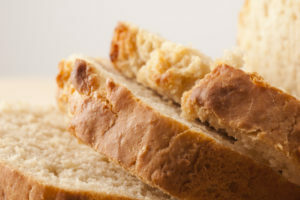 Who knew that mixing flour and beer could make a delicious loaf of bread — no eggs, water, or yeast needed. Now that you’re in on the secret, grab a brew and get baking with this tasty loaf. Some dessert recipes call for espresso to heighten the flavor of the chocolate, but why use coffee when you can use beer instead? 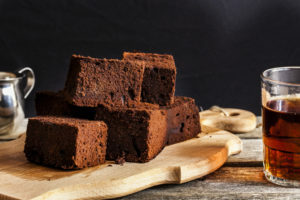 This boozy brownie recipe calls for a dark beer, so stock up on your fave.